Will bonhomie between sons bring titans Virbhadra, Sukh Ram closer? In a major crackdown against illegal mining, the police on Sunday impounded eight vehicles involved in the extraction of stone and mining material from the Beas and its tributaries at Jaisinghpur. The police team was led by the SHO, Lambagaon. A news item highlighting the miserable condition of residents of Jaisinghpur owing to large-scale illegal mining and pollution was carried out in these columns recently. The SHO said the vehicles had been parked at the police station and cases under relevant sections of the IPC and the HP Mining Act had been filed at the Palampur court. SP, Kangra, Santosh Patial said seeing the police force, members of the mining mafia tried to flee, but the team managed to impound eight tippers and tractor-trailers. The SP said local residents had complained of pollution in the Jaisinghpur area owing to the presence of stone crushers. Residents informed the police that most stone crushers were functioning from government land and also extracting material from local rivers. The SP said the mining authorities and the local administration should join the police to end the menace. 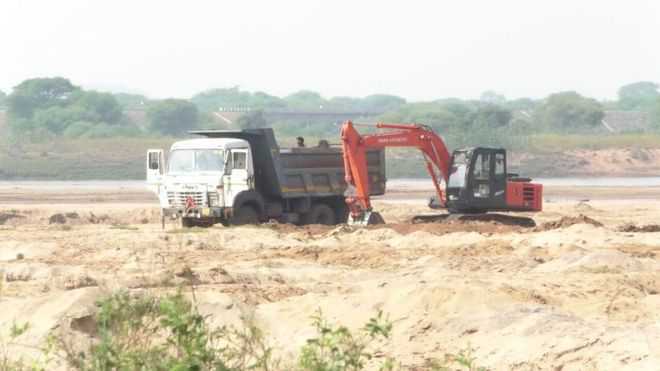 The police official said mining was not only resulting in large-scale environmental degradation and pollution in Jaisinghpur, but also causing a huge loss to the state exchequer by lifting mining material without paying royalty to the government. He said police officials had been asked to deal firmly with mining mafia and stop illegal activities in Jaisinghpur subdivision.